Power dwarf. The less expensive versions of the iPhone have not been a real success so far. This could change with the iPhone SE, because it is very fast, enduring and fills a niche with its 4-inch screen. The iPhone SE surpassed our expectations when it first came out, and now the minimum storage issue has been dealt with, it’s become even better. Really, the only thing it lacks compared to the iPhone 6s is 3D Touch. For anyone who still hankers after a powerful 4in smartphone, it’s an amazing choice. 60% iPhone SE Review: Is It Good for Business? But the iPhone SE is still a solid pick for workers with small hands, or anyone with only basic computing needs. It offers solid security, fast performance and long battery life for $200 less than the iPhone 6S. Budget-minded workers should also check out the Huawei Honor 5X, which sports a metal design, fingerprint sensor and sharp 5.5-inch display for just $199. But if you really just want a smaller screen, the iPhone SE is an excellent option. Most people, I think, will want a larger window to the Internet. That's one reason why the 5.5-inch Samsung Galaxy S7 Edge remains our Editors' Choice for smartphones overall. But I'm willing to create a new category here to give the iPhone SE a prize. Let the iPhone SE be known as our first Editors' Choice for small smartphones, and let's hope that other manufacturers start to give Apple some real competition. It was about time Apple updated its 4-inch iPhone line (and there remain a few of us whose small hands and pockets will appreciate this more portable design), and this is a sensible refresh of a much-loved product. We'd forgotten about just how nice it is to hold and use a petite 4in smartphone, and just how comfortable it is to handle one-handed. The SE is as fast as an iPhone 6s thanks to the A9 chipset and as portable as an iPhone 5s, so if you're in the market for a new 4in smartphone then this is a very good choice. While the lack of 3D Touch, a barometer, second-gen Touch ID or a 128GB storage option are all irritants, that's a combination that will be enough to convince a lot of Apple fans. Assuming you want a smaller screen, the iPhone SE is ounce-for-ounce one of the best bargains in tech. At $399, this is the most affordable iPhone ever, and yet it doesn't look, feel or perform like a cheap phone. While the look of Apple's 4-inch phone is getting up there in age, the iPhone SE has a premium design, and the combination of the fast A9 processor and robust 12-megapixel camera makes this device stand out among midrange handsets. However, I do wish the front camera were sharper, and that you didn't have to give up 3D Touch capability. Apple iPhone SE features a 4-inch display and it is powered by A9 chipset coupled with M9 motion coprocessor. The smartphone sports a 12MP rear camera and supports 4K video recording at 30fps. The rear camera is also capable of recording full HD slow-motion videos at 120fps and time-lapse video with stabilization. The iPhone SE is an excellent smartphone for those of us who just find phablets far too awkward and unwieldy to use comfortably. Phablet fanboys will undoubtedly look down on the iPhone SE which is just as silly as Apple’s previous insistence on selling only one size of smartphone. After all, no one blinks an eye at different sized laptops and that should also be the case when it comes to different sized smartphones. 83% iPhone SE review: Apple’s best bargain? So overall, the iPhone SE is small but as powerful as anyone could need it to be; the battery life exceeds even Apple’s plus-sized handsets; and the screen, camera and all-round quality should be enough to seduce almost anyone who’s in the market for a smaller phone. And the fact that you can forget it’s even in your pocket makes it a nice change from the litany of 5in phones available – it’s a phone that’s there when you need it, but almost invisible when you don’t. You will know a lot of people that will own this phone, although you probably won’t own it yourself. Starting at £359/$399, it’ll sell by the bucketload. It’s an iPhone that’s ridiculously easy to recommend, absolutely ideal for all those people who think they want an iPhone because they’ve seen other people with Live Photos, iMessage and Apple Music but for whom a £500 smartphone is a little too high end. By contrast, the iPhone SE looks and feels like the more mature of the two. The 5C maintains a sense of fun throughout, but the hard, almost boxy edges of the SE indicate it's a phone that demands to be taken seriously. Saying that, we'd much rather pull the SE out of our pocket than put our pink handset on display for all to see. As you might already know, the SE is available in Silver, Space Grey, Gold and Rose Gold. It’s really not difficult to come to a conclusion on the iPhone SE. It’s clearly the best 4-inch smartphone on the market, and you can ignore all of the specs when making that assessment because it achieves that by virtue of being the only offering at this size. For the sake of comparison, you can take a look at some Android devices that are larger than the SE, but smaller than your average Android smartphone. The iPhone SE is an excellent smartphone for those of us who just find phablets far too awkward and unwieldy to use comfortably. Phablet fanboys will undoubtedly look down on the iPhone SE which is just as silly as Apple’s previous insistence on selling only one size of smartphone. Using the SE has reminded me that I made the right choice with my iPhone 6S Plus, just as trying out the larger iPhones likely persuaded a lot of iPhone 5 users to hold out for something smaller. In that regard, Apple has smartened up. The iPhone SE is for people who prefer the advantages of a smaller phone. If you love a small phone but feel you’re missing out on a top-notch camera, solid battery life and speedy processor, the iPhone SE is impossible to ignore. It delivers in spades and doesn't have a comparable competitor. Even though it’s the lowest-priced iPhone we’ve ever seen, it’s still not cheap, especially since the 16GB option is inadequate for most users. However, if you look after it then its resale value will remain high. No other phones retain their value quite like iPhones do. The iPhone SE is a flagship in every right, but a screen size of four inches is too hindering today. Like all iPhone, the Rs. 39,000 price tag can seem overpriced, and is a big reason why the phone is tough to recommend today. If you stricly want a smaller device, then this is the best option for you. If not, there are a sea of Android and iOS phones available to choose from. There is no conspiracy behind the iPhone SE - it's what the fans wished for, and what the critics love to hate. It's always been this way with Apple - polarized opinions versus massive sales. The iPhone SE is an iPhone like any other iPhone. It has top-notch hardware, all the latest camera capabilities, and runs on the latest iOS with everything but the 3D Touch gestures. The only thing that puts us off is the old selfie camera. Apple has surpassed all my expectations for the iPhone SE. Before it launched, I was expecting a plastic handset with an older processor; instead, we've got a metal handset with the latest processor and a top-notch camera. In fact, the only thing that the mini phone doesn't have, which the larger iPhone 6S does, is 3D Touch, and that's something you can easily live without. It was about time Apple updated its 4-inch iPhone line (and there remains a few of us whose small hands and pockets will appreciate this more portable design), and this is a sensible refresh of a much-loved product. We'd forgotten about just how nice it was to hold a 4in smartphone, and just how comfortable it was to handle one-handed. It's as fast as an iPhone 6s thanks to the A9 chipset and as portable as an iPhone 5s, so if you're in the market for a new 4in smartphone then this is a very good choice. While the lack of 3D Touch, a barometer, second-gen Touch ID or a 128GB storage option are all irritants, that's a combination that will be enough to convince a lot of Apple fans. The SE is what many iPhone fans have been asking for, and it's a great upgrade if you're still using an iPhone 5. For 5S owners, things aren't quite as clear cut. If you're not happy with the 5S's performance, the SE should solve that problem. However, unless you really want to shoot 4K videos, you're not going to notice a massive improvement in photo quality. There's a much bigger jump in quality if you're coming from an iPhone 5 (or earlier), however. Make sure 16GB is enough before you order: we'd recommend the 64GB version for most people. Just because the iPhone SE looks like an old device doesn't mean it acts like one. Apple squeezed flagship-level performance and the best battery life we've seen from an iPhone in years into a familiar (and relatively inexpensive) frame. The phone lacks some of the 6s's niceties and its screen is just too small for some, but the iPhone SE is the best compact phone Apple has ever made. There is no conspiracy behind the iPhone SE - it's what the fans wished for, and what the critics love to hate. It's always been this way with Apple - polarized opinions versus massive sales. Like it or not, Apple embraced its past and listened to its fans. One-third of all iPhone users chose to stick with the 4" models either for the compact form factor, or the hefty prices of the newer generation. But those people needed to be brought up to speed so can Apple and the developers can eventually move on from the older hardware. Outside of the Apple ecosystem, this phone is priced high enough to face tremendous competition from “nice” mid rangers and “cheap” flagships, but we still recommend it as a solid offering depending on what an individual consumer’s needs might be. If nothing else we can hope this encourages even more of a race towards building powerful, “flagship” performance into mid-tier devices. One of the most unique things about the Apple iPhone SE is that it's in a class of its own: there is no other phone of such size that's even remotely as powerful. It's the only high-end mini phone you can find on the market, safe for the Sony Xperia Z5 Compact. So why is that? Is it because people no longer want small phones, or is it because people who fancy small phones today usually don't need them to be fast and powerful? The iPhone SE is a great smartphone that brings plenty of power in a small package. It's designed to appeal to those who aren't fussed by today's typically large flagship phones. If you are upgrading from the iPhone 5S or iPhone 5 and don't want a larger phone then the SE is a no-brainer. It's faster in every aspect and delivers a phone that will feel familiar but deliver the goods at today's current top-spec level. As mea culpas go, the iPhone SE is a winning way to right a balls-up. Any 4in iPhone owner who’s resisted the 6s’ siren call should pick up an SE. Pronto. The iPhone SE doesn’t feel small, it feels compact. And there’s a massive difference between those two concepts. Given that most phone makers are saving their best specs for their biggest phones, the fact that Apple has crammed all that tech into such a small package is a feat in itself. It's an even more enticing proposition for those who are in the market for an affordable-ish, modestly sized smartphone, as we can't think of a small device that compares in terms of overall performance. The iPhone SE is by no means perfect with its 16GB storage option and poor front-facing camera, and it'll no doubt be too small for some, but it's undoubtedly the best 'mid-range' smartphone on the market today. On the other hand, it's just 2011's design rebadged and a new engine put inside. Far from being a new phone, it's the iPhone 5SS, another iteration on an old design - but one that's a lot cheaper to buy. It's also got a much smaller screen where it's proved that larger displays are the popular choice now, with apps in particular making use of the extra space. Ultimately, Apple's given consumers a great choice here and actually for a half-decent price. The iPhone SE is a brilliant phone for those that want something smaller in their pocket and don't care about tired design - and I suspect there will be quite a few of those buyers out there. That leaves the iPhone 7 launch later in the year as the Next Big Thing, but it also fills in a gap not only in Apple's range but in the smartphone segment in general. There are people who want compactness without compromised specifications, and the iPhone SE ticks the right boxes with its great camera, capable processor, and solid - even if unsurprising - style. I’m a dedicated follower of big phone fashion, but the iPhone SE is almost enough to tempt me away from my iPhone 6 Plus. I often wish for a smaller phone when I’m cramming my outsized phone into a cycling jersey, or just leaving the house without a jacket, and this little iPhone punches way above its weight. It is a little puzzling why Apple didn’t do just a little more work on the design to give it a further point of difference for people who already have an iPhone 5 or 5S, but perhaps it tried to do a new version of the iPhone 5C and decided that bright coloured cases didn’t work for Nokia/Microsoft, so why bother? It’s got a smaller screen and a smaller price tag to match, but the iPhone SE doesn’t compromise—it’s nearly as capable as Apple’s flagship iPhone 6s. The iPhone SE doesn’t feel small, it feels compact. And there’s a massive difference between those two concepts. Given that most phone makers are saving their best specs for their biggest phones, the fact that Apple has crammed all that tech into such a small package is a feat in itself. I was dreading doing this review. It’s not something I like to admit, but sometimes, there are gadgets that occasionally bring a small amount of discomfort. It’s like knowing you’re going to have to do something not overly comfortable, like visiting a dentist and dreading the possibility of words like “we need to replace something” even though it’s probably going to be all right. With the new iPhone SE and 9.7-inch iPad Pro, Apple is trying to fill holes in its product line and encourage more upgrading. It reminds me of the days when the company sold a whole range of iPod models, from well under $100 to about $400, at roughly $50 intervals. The idea, then and now, was to cover the waterfront. You couldn’t go wrong with most of these iPods, and you won’t go wrong with these two latest Apple products. Just because the iPhone SE looks like an old device doesn't mean it acts like one.Apple squeezed flagship-level performance and the best battery life we've seen from an iPhone in years into a familiar (and relatively inexpensive) frame. The phone lacks some of the6s's niceties and its screen is just too small for some, but the iPhone SE is the best compact phone Apple has ever made. Me? I’m not going back to a small phone. Sure, it’s not as easy to hold in one hand, but my gargantuan iPhone 6s Plus is so much better for watching movies, so much more suited to reading books and long articles, so much more pleasant to type on, that I can’t give it up. The iPhone 5s, and by extension the SE, are for people for whom the smartphone is a tool, not a lifestyle. And for better and for worse, our phones are becoming extensions of our lives. Notably, the iPhone SE looks and feels just like the iPhone 5S before it. It didn't get slimmer, or more round, but we kind of dig it. There's something novel about maintaining a tried-and-true design motif while overhauling everything within; indeed, that's exactly the model Apple followed when transitioning from the iPhone 6 to 6S. The iPhone SE is priced at Rs. 39,000 for the Indian market, and headed to the country in "early April". Earlier, the company had announced the price as Rs. 30,000 which made the iPhone SE a pretty attractive option, but at the 'new' price tag, the phone might face an uphill battle especially early on its life when there may not be many discounts on offer. Stay tuned for a detailed review of the iPhone SE on Gadgets 360. Positive: Slim size and lightweight; nice design; decent autonomy. Model: The Apple iPhone SE is a new 4-inch iPhone. Despite being an iPhone with a smaller display, it is equipped with a high-end A9 chipset and 2 GB of RAM, which is the same as in the iPhone 6s. The internal memory is either 16 GB or 64 GB. Besides that, it has a PowerVR GT7600 six-core GPU, which maximizes gaming and application performance. The iPhone SE runs iOS 9, which is the latest iPhone operating system with latest features and security updates. The camera of the iPhone SE is a 12 MP iSight camera with dual-LED flash. Just like the iPhone 6s, it is also capable to record 4K video. The front camera supports FaceTime with Retina Flash that allow the display to flash brighter in low light, which enhances selfies and FaceTime video calling experience. The design of the iPhone SE is a bead-blasted aluminum body with chamfered edges, which gives the device a satin-like finish. 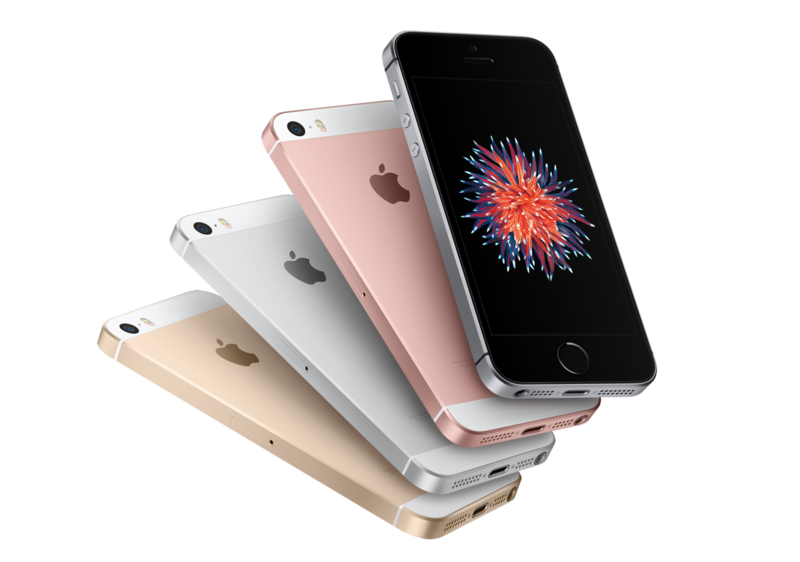 For color selection, the iPhone SE offers space gray, silver, gold and rose gold to suit different likings. The device weighs only 113 grams, making it a very lightweight and handy device to carry around. Other sensors included in the iPhone SE are a Touch ID fingerprint sensor, a three-axis gyroscope, an accelerometer, a proximity sensor, and an ambient light sensor. Imagination A9 / PowerVR GT7600: Integrated GPU consisting of 6 clusters with 192 ALU (FP32) and support for Metal/OpenGL ES 3.x. The GT7600 is the fastest smartphone GPU at the time of announcement on September 2015. Non demanding games should be playable with these graphics cards. » Further information can be found in our Comparison of Mobile Graphics Cards and the corresponding Benchmark List. A9: System on a Chip (SoC) in the Apple iPhone 6s and 6s Plus. Based on the 3rd generation of Apples own 64-Bit processors (ARMv8 compatible).» Further information can be found in our Comparison of Mobile Processsors. 85.66%: This is a good rating above average. Nevertheless you should not forget, that 10-15% of all notebook-models get a better rating.